Boots as good as Lowa's deserve that little bit of extra care and attention, with the right kind of treatment your boots will remain comfy, water resistant, and they will simply last a lot longer. During its life an animal's hide is kept in top condition by its sebaceous glands, the 'sebum' produced stops the skin from drying out and keeps it soft. But after the tanning process, it's up to you to keep the leather supple and prevent cracking. 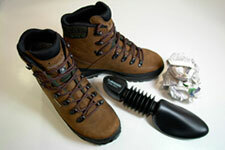 Ideally your boots should be allowed to air and dry properly after each and every use, this can be helped along by removing the insoles and laces. Insoles can absorb a fair amount of moisture during use and they will dry out much quicker outside of the boot, removing the laces simply allows you to open the boots up wider and grants easier access to certain parts (e.g. the tongue). In a perfect world, leather boots should be really dried out for 24 hours before being used again. In most instances when there is just normal levels of dirt, you can simply brush it off under warm running water (in hard water regions, you are advised to use distilled water to clean with). If you have heavily soiled footwear then start off the same way, but it is then advised to use a specialist shoe cleaning product designed for ground-in dirt. If you are using cleaning products, make sure you 'impregnate' your boots thoroughly afterwards (cleaning products open up the leather's pores, impregnation closes them again). Lukewarm soap suds are usually a good substitute for specialist cleaning products and can also be used to clean the in-soles. After all that warm water, soap and scrubbing, the leather is now in an unprotected “open-pored” state and needs to be waterproofed. 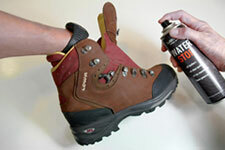 In order to “close” the leather's pores again, an impregnating spray should be used whilst the boot is still damp. Proofing on a regular basis helps prevent water and dirt absorption, leather that is completely soaked has no breathing properties which can have a disasterous effect on the internal microclimate of the boot. Please note that proofing will only be fully effective 24 hours after application (smooth or waxed leathers are easier to care for than nubuk or suede and more resistant to water and dirt). The officially recommended product is Lowa Water Stop but of course, many other brands are available. 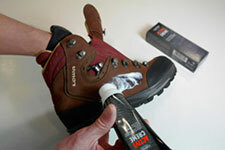 Depending on the amount/type of use, you should polish your boots with wax-cream or wax-emulsion on a regular basis. When footwear is frequently exposed to extremely wet conditions, the leather's natural properties eventually get washed away. If not treated the leather will slowly dry out, become brittle and eventually crack, leaving your Lowa boots irreparably damaged. To prevent this, apply your leather care product using a cloth, then polish it off with a brush. Carefully warming the leather with a hair dryer will help the product to be absorbed even deeper into the leather. After the cream has been applied the boots need to be given ample time to dry, but never ever place boots to dry on a radiator, too near to the oven, in a car windscreen or in the boot. Wet leather “burns” very easily (i.e. it becomes brittle and shrinks) and this often results in irreparable rips in the leather at the flex points. Lowa recommends its own Lowa Active Creme for this care regime but there are plenty of alternatives available. The use of oils or greases is not advised because, although they leave the leather very soft and water resistant, they compromise the stiffness and stability of the boot. Oils and greases can also clog the leather pores, preventing the leather from breathing and creating the dreaded 'rubber boot effect' (in worst case scenarios they can even dissolve the glues used in the footwear). The leather lining should be treated with a liquid leather conditioner (such as Patina or Keralux LCK). Occasional application can prevent the destructive salts in foot sweat from drying out the lining and making it hard and brittle. Never ever wash leather footwear in a washing machine! The high temperatures plus the effects of the wash cycle can make colours run, damage the outer material, and dissolve the glue. The textile elements in your footwear should also be proofed on a regular basis in order to maintain the ability to repel dirt and water. Boots should always be well aired and allowed to dry out completely after use, always remove the insole and open up the laces. Never place boots to dry on radiators, near ovens, even on the dashboard of the car. Wet leather is very susceptible to high temperatures and can become brittle, weak and even shrink. 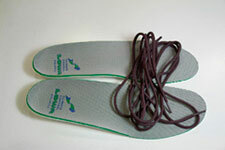 Often this can lead to permanent cracks appearing along the flexzones on the boot.